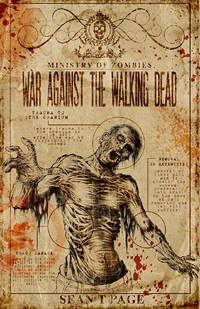 War Against the Walking Dead, by Sean T. Page – Book Review | We Zombie! Sean T. Page of the Ministry of Zombies in the U.K. has already created a zombie survival guide called The Official Zombie Handbook UK, so why have they released another book? Because this is not another survival guide – this is a book to teach you how to take back the world once the initial zombie apocalypse has peaked. There will be dead roaming the earth and any remaining human survivors will need to band together to eradicate the zombie plague and make the world suitable for humans again. That’s what this book is about – taking back the world. The book starts out with a section called “Know Your Enemy,” which is a great introduction into the science and mind of the walking dead, and includes some background on various experiments – some government, some private research, that various groups have pursued with the intent of understanding and possibly controlling the walking dead. Part II explains what the landscape of human survival will look like after day 90 – those that have survived will be looking to rebuild and create a survivor community that can provide a normalcy of life, even if it will be dramatically different than before the zombie apocalypse. This section teaches you how to make contact with, analyze intent, and decide whether they are worthy to join your group. It even has some sample forms for checklists and a sample legal agreement to be signed by the new members swearing their allegiance. It also describes the types of survivor groups you will encounter: robber barons, army renegades, religious cults, cannibals, lone survivors, walking dead lovers, etc. The next section of the book describes some famous battle lessons that people learned the hard way, or perhaps a novel fighting technique was stumbled upon that changed history. I found this section of the book particularly encouraging, as I read how some small groups have managed to battle and win over much larger and better outfitted groups. Sections IV and V deal with the task of building your forces for battle, including creating an air force, navy, and even special forces units. Sounds impossible, but Page has outlined ways to make this happen – the use of ultralights, for example, for air support and recon, and small motorboats for travel by water. In section V, you are taught about various weapons of the war, from basic hand weapons, firearms, fire and fungus, even through nuclear options. Sections VI teaches us war tactics – basic infantry operations, static defense, attack formations, and the zombie clearing system. The clearing system is explained in detail and is made up of three parts – the kill squad, the cleaning squad, and the rebuild squad, with each squad working independently, marking their progress on the buildings with spray paint. The first squad paints a pattern that is updated by the following squads as they proceed – very effective, and this is a must if you expect to develop an area for your new community that is safe and there are no surprise zombie attacks in the middle of the night. Section VII deals with the victory over the walking dead – how many zombies you’ll have had to kill, what does victory look like, and where to go from here. There are some great scenarios of different types of survivor communities and what life would be like under each type of survival scenario, with pros and cons of each type. One such scenario is underground living – don’t laugh – it could come to that! Finally, the last section contains resources for finding survivors, as well as other sources of information and suggested reading material. If you are planning on surviving the zombie apocalypse, you’ll want to read this book. There are many survival guides out there, but this is the first I’ve seen that addresses phase 2 of the apocalypse: rebuilding. Get this book, read it, and then carefully place it in your bug-out bag while there’s still time.